Meeting the Mayor, originally uploaded by lightwriter27. I had an assignment to cover a press conference at the Shelby County Cemetery. The conference was kicking off a week-long focus on infant mortality, and running along the edge of the cemetery was a sub-division. As the press conference continued, this group of kids started to converge to the stage as kids do when they see any kind of commotion involving a stage. The kid on the right, Garrett, walked from the farthest point of the cemetery, just be bopping along without a care in the world. A couple of the people attending the conference chuckled to themselves watching him cut across the cemetery. 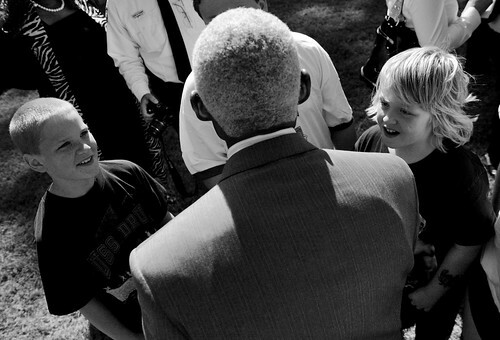 They patiently waited for the moment to meet with the Mayor Wharton, and they got to meet him and get a photo taken with him. I kind of pre-visualized how I wanted to try to sneak a chance to snap this moment while I trying to find other little moments more geared for my assignment. So, this was kind of a shot in passing, but it’s more or less how I saw it play out in my head. It’s always fun when life happens as you visualize it.